In 1586, infamous English pirate Sir Francis Drake occupied Cartagena for over a month, burning and looting much of the city before being paid a hefty ransom. Read on to learn more about the history of Drake’s sack of Cartagena. Map showing Sir Francis’s Drake’s attack on Cartagena. 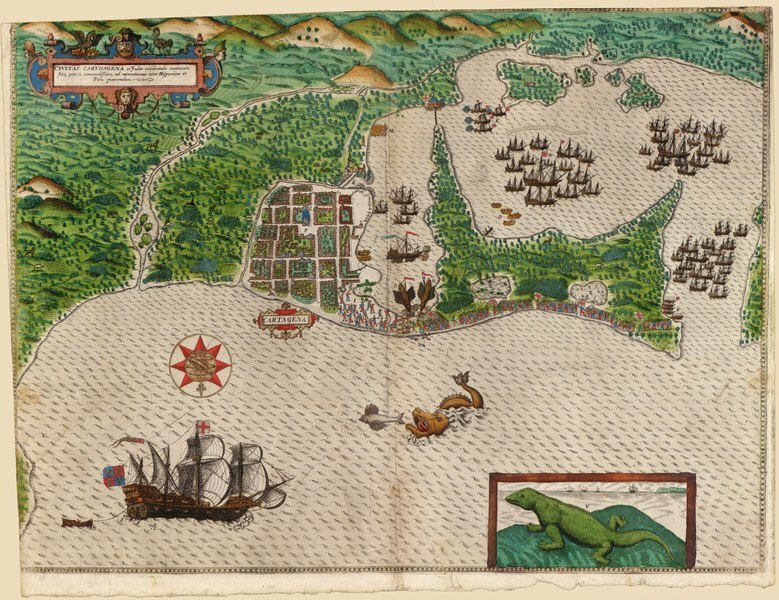 Read on to learn more about Drake’s sack of Cartagena in 1586. The 16th century saw growing tension between England and Spain. These tensions fit largely into the context of religious tension across Europe in this period. Martin Luther’s publication of his 95 theses in 1517 had set off a wave of challenges to the power of the Catholic Church. In 1534, King Henry VIII of England, after failing to get approval for an annulment of his marriage, took England out of the Catholic fold. Queen Elizabeth I, upon her succession to the throne in 1558, worked to institutionalize this change. 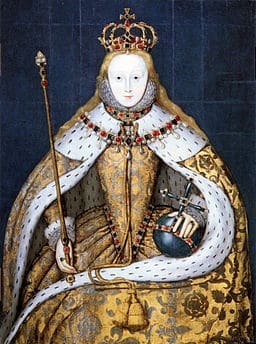 Shortly after becoming queen, she adopted laws that upheld the Church of England as separate from the Roman Catholic Church but remained fairly moderate. With her excommunication by the Pope in 1570 and the Catholic Counter-Reformation underway, King Phillip II of Spain saw her as an enemy. Elizabeth I Image Source: Wikimedia Commons. In the context of these religious tensions, economic and political tensions also emerged. By this time, Spain had established a budding empire in the Americas based largely on the looting of gold from indigenous peoples and, increasingly, from the silver mines at Potosí in modern day Bolivia. England meanwhile was yet to emerge as a true international power. Its first ill-fated colony in the Americas at Roanoke was not established until 1585. However, it had become a growing naval power, in part through the use of privateers. Privateers were privately outfitted ships and expeditions that were given licenses to attack the naval trade of another country. Put another way, they were pirates who worked for a particular country. Raids carried out by English privateers against Spanish shipping and colonies had only increased the tensions. One of such raiders was Francis Drake, who would go down as the most famous of Elizabethan England’s privateers or “Sea Dogs.” Drake had become a crewman on a trading ship in his early teens, and eventually went to work for John Hawkins, who led several slave trading expeditions to the Americas in the 1560s, including one where he sold slaves in Riohacha in modern day Colombia. Drake first sailed to the Caribbean in 1567 on another slave trading expedition led by John Lovell. He then joined Hawkins’s third Caribbean voyage which set out in October of 1567. After arriving off the Venezuelan coast and failing to trade at Margarita (trade with the English was illegal), they proceeded to Santa Marta where they sold over 100 slaves. They sailed by Cartagena, but the city’s guns opened fire upon their arrival, and they sailed away. When arriving at Veracruz, Mexico, Hawkins and Drake were duped by a false offer of a truce broken in a surprise attack by the Spanish garrison, destroying much of their fleet. Both men were able to escape and eventually return to England. However, this experience undoubtedly instilled in Drake a deep desire for revenge. Along with a Protestant zeal, Drake now saw himself practically as on a crusade against the Spanish (granted one that also allowed him to make lots of money). Drake led another expedition to the Spanish Main (the Caribbean trading ports) in 1572 and 1573. This expedition included a venture to Cartagena where he found a fleet waiting for him. He returned to England after a raid on a Spanish silver shipment across Panama. He next organized an expedition to the Pacific, sailing through the perilous Magellan Strait and raiding Spanish colonies and trading vessels up the Pacific coast of South America. There he succeeded in capturing a Spanish treasure ship carrying gold and silver worth as much as $75 million dollars today. He then sailed as far north as the coast of Canada before sailing across the Pacific, through the Indian Ocean, around Africa, and finally arrived back in England in mid-1780. His voyage had lasted 33 months and it made him the second person to have successfully circumnavigated the globe. He was hailed as a hero, was knighted, and was now fabulously wealthy to boot. Drake’s exploits may have made him a celebrated figure in England, but in Spain he was loathed. His raids had only added to the tensions in the growing Cold War-esque conflict between England and Spain. Those tensions had come to a head by the mid-1580s with Elizabeth’s support for Protestant rebels in the Spanish held Netherlands. Drake’s Pacific expedition, and Elizabeth’s embrace of him (not to mention the fact that she had been a secret investor in the expedition) brought them to the breaking point. Sensing war was on the horizon, Elizabeth hoped that a daring raid on Spanish colonial possessions in the Caribbean would serve three purposes. First, it would put England on the initiative. Second, the plunder would help provide funds to fund a future war. Finally, and perhaps most importantly, that plunder would come at the expense of Phillip, making it more difficult for Spain to carry out a war. Naturally, it would fall to the now infamous Drake to lead the expedition. In fact, he himself had long been a proponent of just such an expedition. He began planning and readying what he would call his Great Expedition. The expedition was funded as a joint-stock venture (lest we ever forget the origin of investing), and different people contributed money, ships, men, and/or resources in exchange for a promise of a share in the expected loot. Many of England’s most prominent officials as well as Queen Elizabeth herself were secret shareholders in the venture. Drake’s fleet numbered 29 ships with around 800 crewmen and 1,600 soldiers. It was the largest fleet England had sent to the Americas. Officially, Drake was to demand redress and compensation from the Spanish authorities for his earlier losses on the voyage with Hawkins. Spanish refusal would then allow him to use force to get it. However, in reality, this was nothing but a pretext and the real goal was an attack on the Spanish Main meant to disrupt Spanish trade, raid its colonies, and possibly even capture the annual treasure fleet. Drake’s fleet set sail from Plymouth on September 14, 1585. After setting sail, he narrowly missed intercepting the returning treasure fleet off the coast of Portugal. He then raided the Cape Verde Islands, where he burned two towns. Likely he was using them as an example to ensure the Spanish would be willing to pay ransoms rather than let their colonies in the Caribbean suffer a similar fate. In November, he set out across the Atlantic to the Caribbean. His crew suffered badly from a virus and more than 300 died on the voyage across the ocean. After reaching the West Indies and taking some time for his remaining men to recuperate, he set his sights on Santo Domingo, capital of Hispaniola (in present day Dominican Republic). Santo Domingo was a major religious, commercial, and administrative center of the Spanish colonies, and Drake undoubtedly chose it as much for its symbolic value as its potential for loot. Attacking it would make it clear he could attack any city in the Americas. 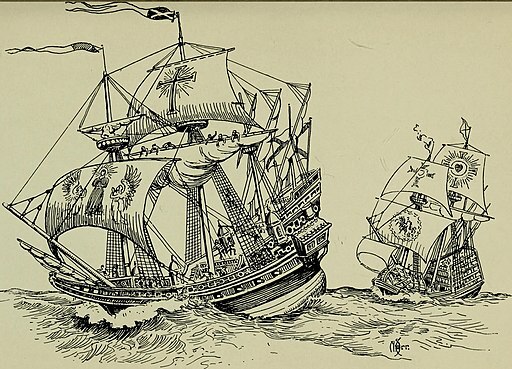 During the assault, Drake practiced the same tactic he would later use at Cartagena, using his ships as a diversion by bringing them up as if he planned to conduct an assault, while a land force marched from outside the city. The assault took place on New Years Day 1586. Drake’s forces easily took the city and his men set to work to plunder it. Under threat of its complete destruction, the governor was forced to pay a ransom of 25,000 gold ducats. This was less than Drake had hoped to get, but he was eager to continue his expedition. Drake’s Raid on Santo Domingo. Image Source: Wikimedia Commons. With rumors reaching Spain and the rest of the colonies of his actions, Drake’s fame continued to grow. The only question was where he would strike next. That target would be none other than Cartagena de Indias. He chose it due to its importance as a major treasure port where much of the gold and silver extracted from the mainland colonies was stored before being shipped back to Spain. Luckily, the people of Cartagena had received warnings from Spain and Santo Domingo, and knew Drake was likely to hit them next. Governor Don Pedro Fernandez de Busto made preparations for Drake’s impending attack, mustering militia and shoring up the city’s defenses. Drake first arrived to Riohacha before sailing along the coast towards Cartagena. Cartagena’s geography made it difficult to attack. While the city sat on the seaward coast, strong winds and currents made it difficult to anchor there and nearly impossible to successfully land a ground force. 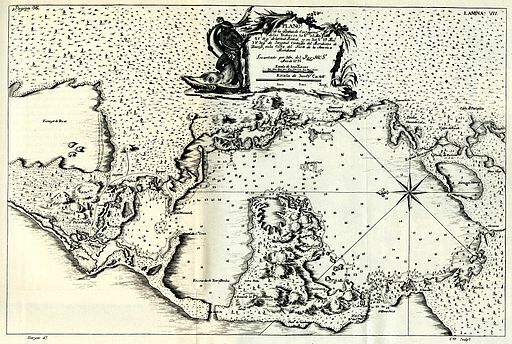 That meant that Drake would have to enter the harbor through one of the two narrow channels known as Bocagrande and Bocachica that lie on either side of the island known today as Tierrabomba. After sailing into the outer harbor and anchoring his ships out of range of the city’s cannons, Drake began to plan his assault. When looking at Cartagena today, it’s important to keep in mind that at this point the only part of the city that had been developed was the Centro, and the city’s iconic stone walls were yet to bet built (they were in fact built largely as a response to Drake’s raid). The city did have some wooden walls and earthworks as well as a fort named el Boquerón that protected the entrance to the inner harbor near where the marina in Manga stands today. However, many of the city’s guns were old and in disrepair, leaving it vulnerable. Therefore, Drake chose to land foot soldiers on the strip of land off the Bocagrande Channel. His men landed on the beach overnight on February 9 near where the Bocagrande Hospital is located today in Castillogrande. They then marched towards the city. In the narrow stretch of land between Bocagrande and the city, the Spanish had built an earthen wall with a trench in front of it and four cannons to fire on the approach. Two ships in the harbor also were in position to fire on the advancing English. However, there was one glaring weakness. The English had arrived at low tide, leaving a gap on the Spanish right where the earthen wall ended and only a handful of wine barrels filled with sand blocked the passage. The English force made for this gap and after a brief struggle succeeded in throwing aside the barrels and opening up a breach in the defenses. The Spanish defense quickly routed and within minutes the English were inside the city and by dawn of February 10, the English were in firm control of the city. The two Spanish ships in the harbor were damaged and scuttled in the fighting, however the fort of El Boquerón held out. Its defenders abandoned it the next night, leaving Drake in complete control of the city on February 11. Casualties on both sides were remarkably low. The Spanish reported only 9 men dead, while the English lost 28. 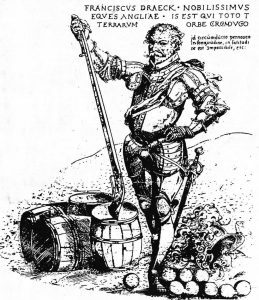 Drake had ordered his men not to pillage the city but when they entered many looted and ransacked many of the city’s homes before they were gotten under control. See also: Visitor’s Guide to Cartagena’s Naval Museum where there are some excellent dioramas recounting Drake’s attack on Cartagena. However, many of Cartagena’s citizens had taken their valuables with them when fleeing before Drake’s arrival, not leaving much to loot. Drake took up residence in the home of Alonso Bravo, a Spanish captain who had been wounded in the fighting, and set to work to negotiate a ransom for the city. Interesting fact: the home where Drake stayed is now the boutique hotel Casa de Alba. Why not imagine you were the Sea Dog yourself and stay there on a visit to Cartagena? Drake demanded both smaller ransoms from individual citizens like Bravo as well as a larger one from the city at large. He first demanded an outrageous 400,000 pesos (if Drake had been born today, he would be natural street vendor in Cartagena) but the Spanish offered only 25,000. At that, Drake began burning houses in the city. In total, almost 250 houses were burned before the Spanish relented and offered more. Drake agreed to accept 107,000 pesos in addition to the smaller individual payments. For several days mule trains carried gold and silver to Drake’s ships. When factoring in all of the loot and ransoms as well as all the cannons of the city, Drake’s total haul from Cartagena is estimated at around 500,000 pesos, even more than what he had gained from his treasure ship in the Pacific. However, overall, this was a disappointing number given the number of investors and crew the profits would have to be shared among and the enormous expectations for the expedition. Drake and his advisors now decided what to do next. 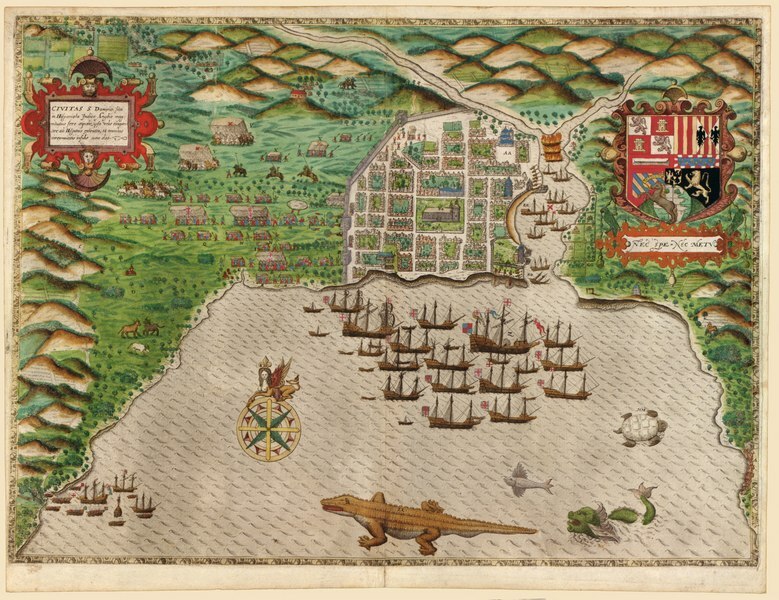 Some argued that Cartagena should be turned into an English colony, but that would have required massive expenditures from the crown to supply and protect it. So, they decided it best to abandon the city and set about making preparations to do so. Unfortunately, Cartagena’s walls were not built until the 1600s and couldn’t protect Cartagena from Drake. During their stay in the city, many of Drake’s men came down with another tropical fever. More than 100 of them died in the weeks following the battle. That left Drake eager to leave. Before leaving, the English took all the goods they could scrounge up for supplies or to sell elsewhere. The fleet sailed away from Cartagena on April 12, 1586, just two days before a Spanish fleet arrived to trap him in the city. With his crew too weakened to continue his original plan to raid all of Spain’s other major ports in the Caribbean, Drake set his sights on home with the hope of raiding one last colony on his way, perhaps Havana. He also wanted to visit Sir Walter Raleigh’s new colony Roanoke in North America. He did in fact make landfall on the southern Cuban mainland, where according to legend his sickened soldiers mixed limes and cane liquor from the local indigenous people to help remedy their fevers, thereby inventing an early version of the Mojito. However, strong winds blew him off course when he rounded the eastern tip of the islands. He therefore settled to sail north towards the English colony. On the way, he raided St. Augustine in Florida, burning much of it to the ground. He then headed up the North American coast until he encountered Raleigh’s colony on an island just inside the Outer Banks of North Carolina. With the colony struggling, the colonists decided to set sail back for England with Drake, although just a week later a boat with a years worth of supplies and more settlers arrived. What happened to them and the ill-fated colony of Roanoke remains one of history’s unsolved mysteries as a year later they were all gone. 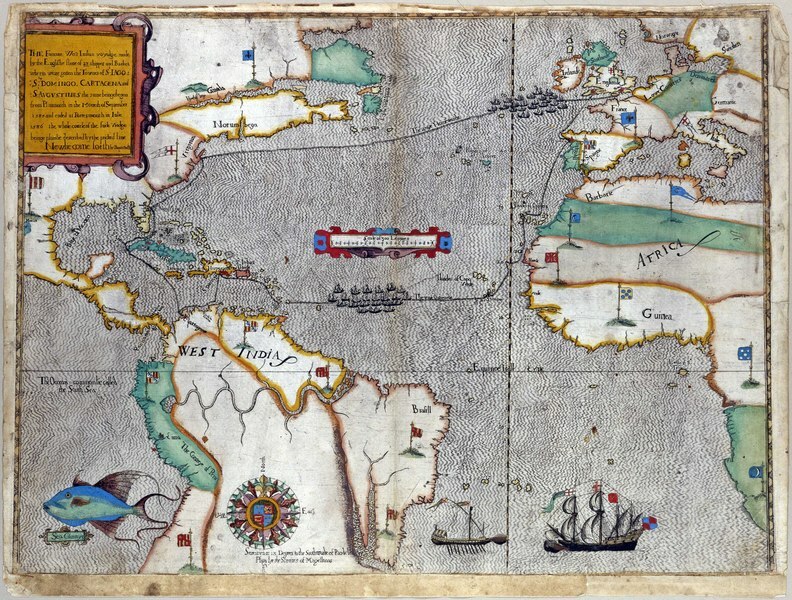 This map shows the route of the entire Great Expedition, including Drake’s raid on Cartagena. Drake finally arrived back to Plymouth in England by the end of July 1586 after a 10 month expedition that had led to the deaths of hundreds of his crew but did return a fair amount of plunder, even if it was less than originally expected. 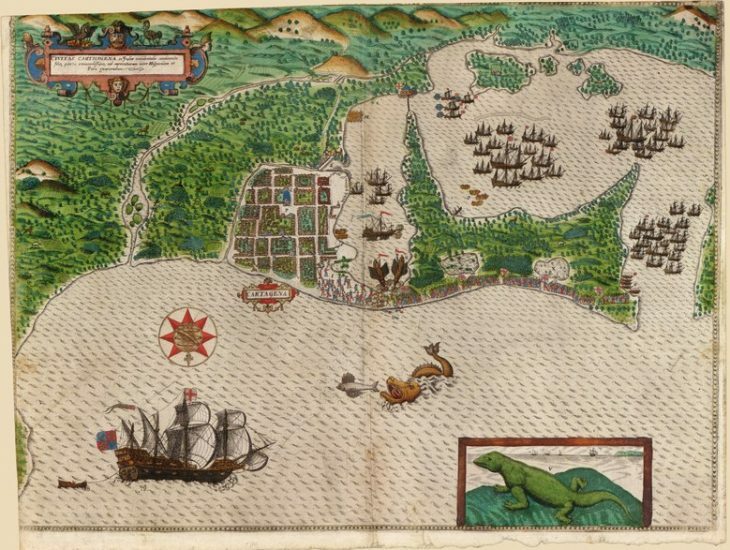 Perhaps most importantly, Drake’s raid also pointed out the vulnerability of the Spanish and would go on to have consequences for English-Spanish relations as well as for the city of Cartagena. Financially speaking, Drake’s expedition was not so successful. Officially, the investors actually took losses, only receiving 75% of their original investment, however the goods that were returned to be sold would have covered them and produced some profit. Still, overall the so called Great Expedition was a financial failure and didn’t bring the riches many had hoped it would. Drake’s Great Expedition did have important diplomatic consequences however. Although Drake’s original plan to raid all of the major ports on the Spanish Main did not come to fruition due to the toll of disease, in many ways, his expedition had accomplished its major goal. It had made Spain look vulnerable. The successful attack and razing of two of its most important colonial cities was a major humiliation for Spain and destroyed any illusions of invincibility. Drake’s raid on Cartagena also likely made war inevitable. Although one of the motivations was to cause such a loss to Spanish coffers as to make them think twice about going to war, there was little chance the Spanish would ever have accepted such an affront with out wanting to take revenge. After the Spanish succeeded in putting down the English supported rebellion in the Netherlands, King Phillip decided to deal with the English threat directly. The Spanish began making plans for a full scale invasion of England. This invasion force was of course the Spanish Armada, which was defeated by English sailors, amongst them Drake, in 1588. This upset victory helped establish England as a major power to be reckoned with and competitor to the Spanish and French in the Americas. As for Drake, he and his mentor Hawkins both died at sea from disease during another raid on the Spanish Main in 1595-96. Drake’s raid was disastrous for Cartagena. The ransom had to be paid with royal funds and it would take years for the city to repay the royal treasury. Many of the city’s homes had also been destroyed. The governor, Don Pedro wrote to King Phillip about the raid declaring, “I do not know how to begin to tell your Highness of my misfortune.” He and the city’s residents now had to set about rebuilding their homes and the city’s defenses. Drake’s raid had pointed out severe flaws and perhaps what had been overconfidence in the Spanish defense of its colonies. It was this attack that led to the start of the construction of a series of stoneworks that eventually were linked to form Cartagena’s City Wall beginning in 1602. In 1657, a small fort was constructed on the San Lázaro hill just outside the city. The city did suffer one more successful privateer attack from the Frenchman Barón de Pointis in 1697 and was forced yet again to pay a ransom. However, the city would redouble its defenses afterwards. Several forts were constructed around the approaches to the harbor. The fort at San Lázaro was rebuilt and renamed to the Castillo San Felipe, which played the crucial role in the successful defense of the city from Edward Vernon’s fleet in the 1741 Battle of Cartagena de Indias. It was later even further expanded to the massive fortress it is today. See also: History of the Castillo San Felipe, Visitor’s Guide to the Castillo San Felipe, and History of the Battle of Cartagena de Indias. Fortunately, after Vernon’s failed attack, no others dared try to attack Cartagena. However, Drake, celebrated as a hero in England, would forever be remembered and reviled in Cartagena for his attack and looting of the city. Ready to plan your expedition to Cartagena? Be sure to check out our Insider’s Guide to the Best Places to Stay or simply make a reservation today. Check out our visitor’s guides to the Castillo San Felipe, Naval Museum, and Historical and Inquisition Museum where you can learn more about the city’s history. 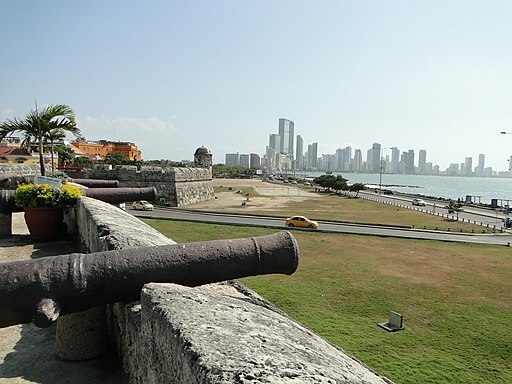 Want to learn more about Drake’s attack and Cartagena’s history? Check out our Comprehensive History of Cartagena or for a shorter read, our Primer on the History of Cartagena. I conducted much of my research for this post from Angus Konstam’s The Great Expedition: Sir Francis Drake on the Spanish Main 1585-86. Check it out on Amazon. 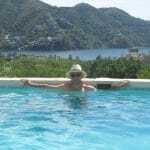 This entry was posted in Learn About Cartagena and tagged History. Bookmark the permalink.